Two astronomers attached to UKZN’s Astrophysics and Cosmology Research Unit (ACRU) have made groundbreaking astronomical discoveries based on data collected by the Hubble Space Telescope. Dr Mathilde Jauzac, a former ACRU Postdoctoral Researcher and a current affiliate of ACRU, has measured the mass of a merging galaxy cluster named MACSJ0416, to the highest precision yet. This has allowed her team, which includes ACRU PhD student Miss Kenda Knowles, to determine the geometry and dynamics of this cosmic collision, approximately 4.5 billion light years away from Earth. This cluster is estimated to have formed 9.2 billion years after the Big Bang. Jauzac led an international research study to analyse data collected by the Hubble Space Telescope’s Frontier Field (HFF) initiative which began exploring the Universe in October 2013. The new data include images from the Hubble Space Telescope’s longest ever exposure of galaxy clusters which lasted almost 24 hours. Jauzac weighed the galaxy cluster by measuring how it warps the space around it, distorting the apparent shapes of distant objects behind it, like the view through a bathroom window. This distortion is known as gravitational lensing, a phenomenon that was first predicted by Albert Einstein. When the cluster is massive enough, such as in this case, and the distant object is aligned right behind the cluster, the distortion effects can be quite dramatic: the images of normal galaxies can be transformed into rings and sweeping arcs of light, even appearing several times within the same image. As a result, one background galaxy can be transformed into several magnified images of the same source. This is referred to as a multiply-imaged system. The more mass in the way, the more the light is distorted which changes the expected position of multiple images. The relative positions, sizes and orientations of these multiple images can be used to determine the mass distribution of the cluster. The more multiple images there are, the more precise the calculation of the mass can be. The HFF initiative enabled Astrophysicists to see the faint galaxies behind the already distant MACSJ0416 cluster, so that more multiple images could be detected than ever before. Jauzac’s discovery shows the accuracy that can be achieved with the high quality of HFF data in terms of estimating the mass of galaxy clusters from gravitational lensing. In astrophysics, masses of objects cannot be measured directly and instead, must be inferred indirectly via other observations. This makes mass estimation a tricky business and prone to various uncertainties. The new HFF data reduces the significance of these errors due to the unprecedented depth at which it probes the Universe, collecting data that is of an improved resolution and higher overall quality. The resultant mass estimates allow for better cosmology which translates to better modelling of the Universe. A Lensing Workshop was hosted by ACRU and funded by the National Research Foundation in January 2014 in order to analyse the first set of HFF data, and to introduce gravitational lensing to the South African science community. It was whilst working on one of the projects at the workshop that Knowles discovered a new multiply-imaged system, leading to her inclusion in the international collaboration. She assisted in the discovery and confirmation of other multiply-imaged systems which were used to provide a better estimate of the mass of MACSJ0416 thus allowing scientists to have a better understanding of the structure of the newly discovered galaxy. The cluster was modelled to be more than 650 000 light-years across and its mass was found to be 160 trillion times the mass of the Sun. This measurement is the most precise ever produced. The uncertainty on the measurement is only around 0.5%, or 1 trillion times the mass of the sun. That may not seem precise but it is for a measurement such as this. This work of Jauzac and Knowles brings new information as to what is physically happening in this massive, merging galaxy cluster, and begins to answer difficult questions relating to cluster dynamics of merger processes and the evolution of structure formation in the Universe. Jauzac and Knowles, along with their international collaboration, will continue their work by studying the five other galaxy clusters that are scheduled to be observed during the next segment of the HFF initiative. 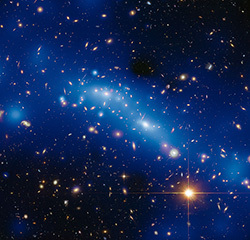 In 2013, Jauzac made international headlines when she used the Hubble Space Telescope to discover the three-dimensional structure of a cosmic filament associated with a different galaxy cluster.